Hakuna Shida Guesthouse i Zanzibar, Tanzania: Bestill nå! The following group types are not accepted by this hostel: Junior / Primary School, High / Secondary School, College / University, Business Trip, Stag/Hen/Bachelor Party, Cultural Group If you have misrepresented the type of group you are booking for, your booking may be cancelled by the hostel." 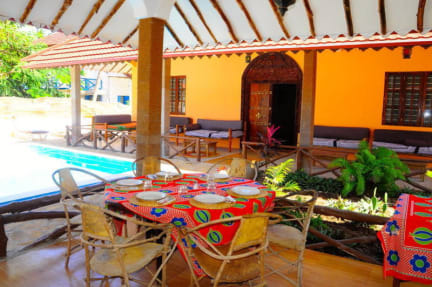 Hakuna Shida Guesthouse is located in the South East Coast of Zanzibar. 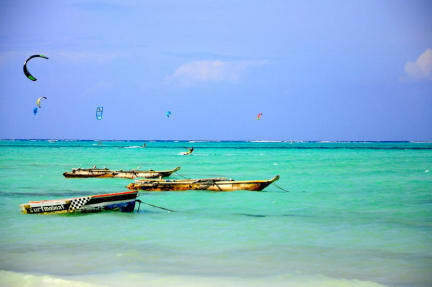 Situated less than 100mts from the most beautiful white sandy beach of Paje, a small traditional fishing village. We are in the middle of the best kite spot in the island. Close to restaurants and bars, dive centre & kite centres. Ideal playgrounds for water sports and relax. The Guesthouse offers private rooms with bathroom for all lovers of the sea and nature, with excellent value for money. The terrace overlooks the pool and offers sun beds. Internet available.